“Tricks or treats” and buckets of sweets. Rows and rows of scary masks, overpriced sweets and fluorescent nylon tights. Pumpkin carving, pumpkin pie and pumpkin soup. Scary movies, popcorn and warm fireplaces. Witches and broomsticks, pirates and eye patches: little children playing at being someone fierce or scary. A controlled game of fear played in the first world under the protective gaze of loving and caring parents/carers. A choice of facing fear and retreating into loving arms when the scary bits get too frightening. Please use your pumpkin to raise awareness for their campaign. And more importantly, use these special family moments to chat to your own children about the subject and make them aware of a very different reality for millions of children just like them. Compassion can never start too early and it ALWAYS starts at home. 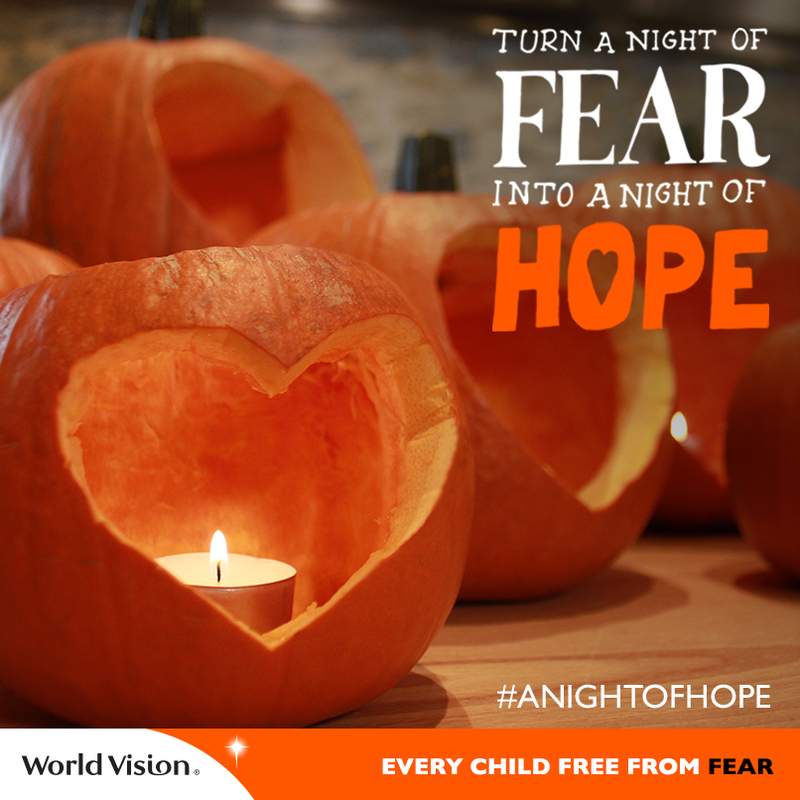 Please do have a look at the Night of Hope World Vision webpage and feel free to download their “Guide to a Halloween free of fear.” It includes instructions on how to heart carve your pumpkin, tips on how to use your pumpkin seeds, and delicious recipes by Lesley Waters for sweet sticky pumpkin tart and pumpkin soup. But more importantly, it includes an awareness printout that can be stuck in the window and a touching story about girls, like Sylvia, facing the unbearable thought of a forced marriage from an early age. My pleasure, Liz, I feel it’s the least I can do!